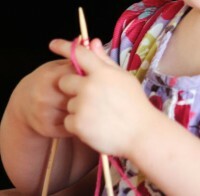 A week or so ago, my little girl asked me to teach her to knit. She’s just four, but she’s been watching me her whole life and I guess she figured it was time for her to give it a try. So I bought her some needles of her own, dug a ball of hot pink merino yarn from my stash and cast on. Every day since, she brings me her knitting (I think it’s a scarf), climbs up on my lap and painstakingly forms the stitches, counting each one. Sometimes, in her excitement, she drops all the finished stitches off her needle, giggles and pokes the needle back through them. She has no fear yet of making a mistake. After five or six stitches, she’ll tell me it’s enough “for now” and dashes off to play. She’s already earmarked several more balls of yarn – yellow, purple and green. It’s going to be one colourful scarf. I feel so lucky to be able to share this with her, and I know that I will never be able to see that particular shade of pink without remembering these sunny afternoons with my little girl. Having learnt to knit as an adult, I have no hazy memories of patient hands guiding mine. My mother didn’t knit and, although my grandmother did, she was half a world away in Sweden. When I visited her, I often watched her knit. I remember her being amazingly fast, her work flowing effortlessly from her needles. I wish now I had asked her to teach me but, for whatever reason, I didn’t. It wasn’t because I didn’t want to learn; I guess I thought I would always be able to ask her later. Now I regret that I missed sharing this with her. Oddly enough, when I finally got around to learning after the birth of my first child, it was a Swedish lady who taught me. So, although I didn’t learn from my grandmother, my dad says I knit just like her. It’s still the best knitterly compliment I’ve ever had. This is so darn sweet. The picture of her little hands makes me a little teary! I’ve taught my students, but they are old enough to worry about messing something up, and the first few rows are always tedious and a little terrifying. I love the thought of a momma and daughter knitting together!